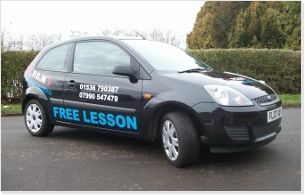 If you want to learn to drive and live in or around Kettering, Corby, Wellingborough, Rothwell or Desborough, then you have a risk-free way of finding the perfect driving instructor for you. Paul Millen is a friendly, patient and skillful driving instructor. And to help you find out, risk free, whether he would be the right person to teach you to drive, he is offering your first lesson free and without obligation. Gift vouchers: If your family might be willing to help you with the cost of driving lessons, they can buy gift vouchers for any number of lessons. Ask them to contact Paul by phone or email for details. Condensed driving courses: Have you got the commitment to learn fast and apply what you learn directly and consistently? If so, our intense driving courses can take you from theory to driving test in a seriously condensed timeframe. This is no soft option, so you need to be sure. Contact us to find out more. To find out more, including the full terms and conditions of this offer, please contact Paul at PSM Driving today. To help you choose the right driving instructor please read more about PSM Driving, or get in touch to discuss your best path to a pass.